In the immortal words of Band Aid (however you feel about the song): “There won’t be snow in Africa this Christmas time”. Well, that’s not strictly true. On December 19, snow fell on the edge of the Sahara desert, giving the red sandy dunes a pretty smattering of the white stuff for the first time in 37 years. The world was alerted to this event by amateur photographer Karim Bouchetata, who posted his photos on Facebook, showing the snow covering the sands surrounding the Algerian town of Ain Sefra. Ain Sefra is located between the Atlas Mountains and the northern edge of the Sahara, around 1,000 meters (3,300 feet) above sea level, and is known as the “gateway to the desert”. Of course, Africa does in fact have snow. Kilimanjaro in Tanzania is famously topped by a snowy cap, while in the Atlas Mountains just 72 kilometers (45 miles) from Marrakech, Oukaimeden has the unlikely honor of being Africa’s highest ski resort at 3,200 meters (10,500 feet). But seeing as the last recorded snow in the Sahara was 1979, it’s still exciting. In fact, NASA’s Earth Observatory has released a natural-color photo of the snow in the desert from space. 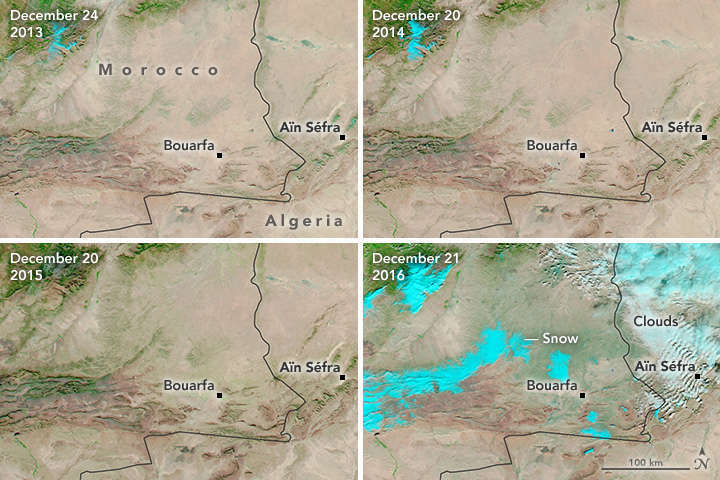 Taken by the Enhanced Thematic Mapper Plus on the Landsat 7 satellite, the image shows the snow on the ground near the Morocco/Algeria border, southwest of Ain Sefra. NASA has also revealed satellite images of the Saharan Atlas range in December for the last four years, taken by their Aqua and Terra satellites, to demonstrate how unusual this event is. The false-colour images are rendered in infrared, shortwave infrared, and visible red wavelengths, with the snow showing as a bright blue-green. So if you're dreaming of a white Christmas this year, however unlikely, you might still get your wish.